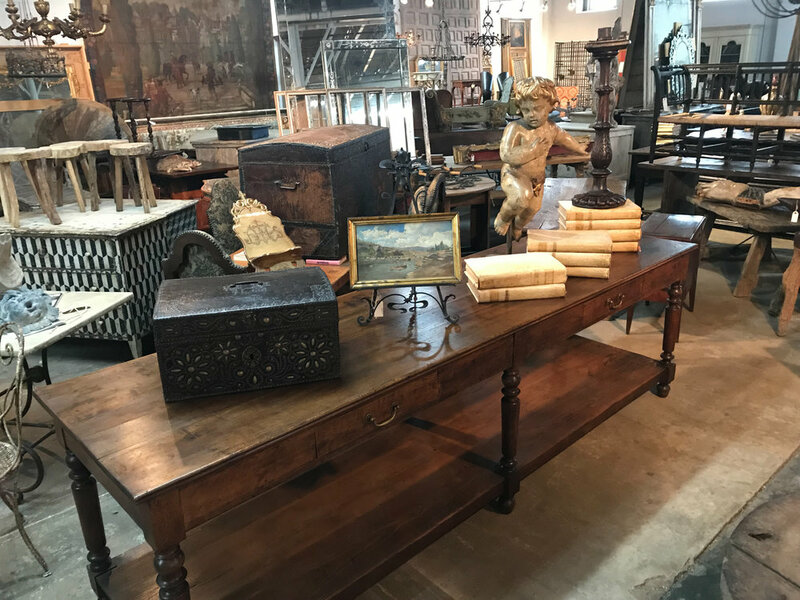 Whether you are a first timer to Market Hill or a seasoned shopper back for more, Provenance Antiques welcomes you to the 2018 fall show. “This is our home away from home,” owners Artur Tybuszewski and Yarek Filipczak say of Market Hill. Provenance Antiques has been established in the South of France since 1997 and in Atlanta since 2001 where they have a 10,000-SF showroom. Their primary focus is Mediterranean-based, cultivating their relationships and resources in France, Italy, Spain and Portugal while procuring the finest antique furniture, accessories, architecturals and decorative arts available. “Our wonderful Louis Philippe period Draper’s table from the South of France (circa 1840) features a stunning French 18th-century petit Marriage Coffre in leather with exceptional bronze nailhead detail; a charming later 19th-century oil on canvas from Northern Spain; a magnificent French 17th-century angel – or Putti in carved wood with its original polychrome finish; a very handsome 17th century altar stick from Northern Italy and a terrific set of 18th-century Italian vellum books,” to name a few.